The first time I watched The Prestige several years ago, I ended up watching it two more times in the same week, each time teasing out additional insight into the central mystery of the film. 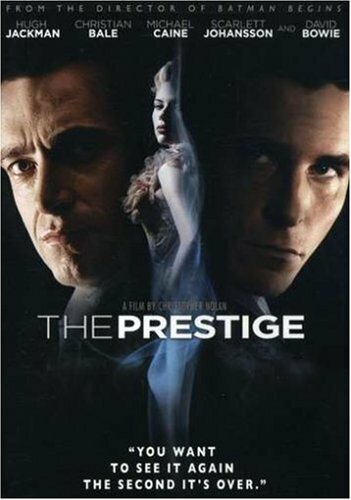 If you’ve seen the other mindbending movies by the Nolan brothers – Inception and Memento – you’ll be prepared for the plot twists and chronological turns The Prestige offers up in such abundance. Hugh Jackman and Christian Bale star as up-and-coming magicians whose lives become entwined after an on-stage tragedy leads to an escalating antagonism and competition between them. Michael Caine plays Cutter, a designer of illusions and Scarlett Johansson and Rebecca Hall portray the women in their lives. The Prestige is a meditation on obsession, compulsion, competition and love. Paying close attention – or multiple viewings – is necessary to truly comprehend the layers of the story. The acting is sublime, especially considering the two leads are best known for their work in comic book adaptations. Hugh Jackman – best known as Wolverine in the X-Men movies – brings a darkness and drive to his role. Christian Bale – whose other work with the Nolans includes a couple of movies you may have heard of (Batman Begins and The Dark Knight) – brings smoldering intensity to his complex and layered performance. The tag line on the movie poster here is right. You will want to watch it again as soon as the credits roll. And each time you watch it, you’ll pick up a new, subtle revelation. If you haven’t seen this masterpiece yet, I highly recommend it. If you have seen it, you know it’s worth watching again.